We offer commercial business visits! Thank you for choosing the experts in HVAC service and HVAC repair, Carolina Air Services of Raleigh. Our contractors are here for your local air conditioning and heating needs! Our Contractors are the premier choice for professional and affordable HVAC repair and maintenance in the Wake Forest, Raleigh, Apex, Holly Springs, Garner, Cary, Fuquay-Varina, Knightdale, Zebulon, Wendell areas. In the HVAC business since 2005, our highly trained contractors strive to address your maintenance and repair needs without exceeding your budget. It is important you choose the right local heating, ventilating, and air conditioning repair contractor for any HVAC service you need done, especially in the case of an emergency. Our HVAC experts will come to Wake Forest, Raleigh, Apex, Holly Springs, Garner, Cary, Fuquay-Varina, Knightdale, Zebulon, Wendell and fix it right the first time! 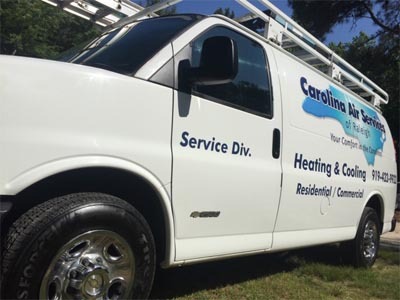 The contractors of Carolina Air Services of Raleigh are trained to examine all the critical factors that may be affecting your building's HVAC problems before establishing the appropriate and most affordable heating/cooling solution. If your heating and air conditioning units are not performing optimally, leave it to Carolina Air Services of Raleigh! We offer HVAC repair and maintenance for all major brands of heaters, furnaces and air conditioners. Click here for more information on HVAC repair near Wake Forest. Do you need to purchase a new heating and air conditioning system? Carolina Air Services of Raleigh can help you determine what HVAC unit is right for your home or office leaving you with a comfortable and controlled climate. Click here for more information on HVAC replacements. Is your energy bill out of control? Contact us and schedule an appointment with our HVAC contractors. By working with Carolina Air Services of Raleigh, you will be given peace of mind through expert recommendations and cost effective options. Experience the advantages that Carolina Air Services of Raleigh has demonstrated to the local community of customers. We are happy to provide HVAC service to the following zip codes/areas: Wake Forest, Raleigh, Apex, Holly Springs, Garner, Cary, Fuquay-Varina, Knightdale, Zebulon, Wendell.